Please note: This is a summary and not the original book. If you're living through the 21st century, but feeling like the pace of life has picked up beyond what you can handle, Thank You for Being Late will help you understand why. 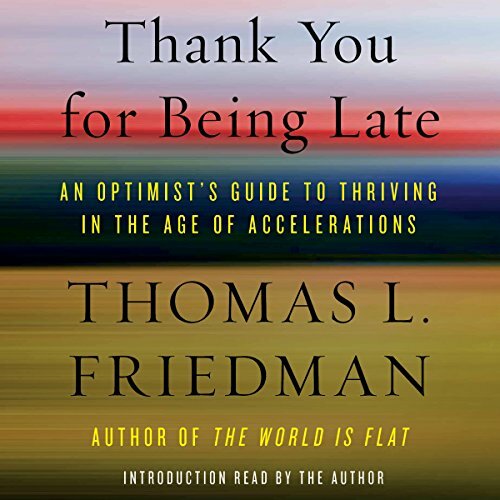 Renowned journalist Thomas L. Friedman has returned to what he does best in this fascinating field guide to modern life - though many of the conclusions he comes to might leave you feeling anything but optimistic. 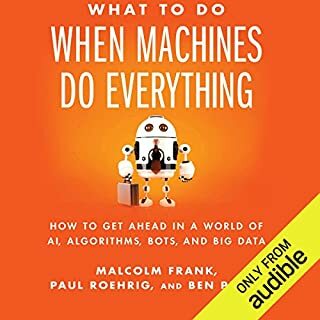 What to Do When Machines Do Everything is a guidebook to succeeding in the next generation of the digital economy. When systems running on artificial intelligence can drive our cars, diagnose medical patients, and manage our finances more effectively than humans, it raises profound questions on the future of work and how companies compete. Platforms connect two types of users in order to exchange something of value. This is different from the traditional pipeline model of business where something of value is created by transferring it from producer to producer with the consumer receiving it at the last step. 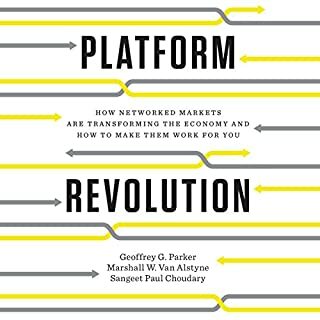 Platforms are dominating production processes particularly because they reduce the costs of value creation, consumption, and quality control. 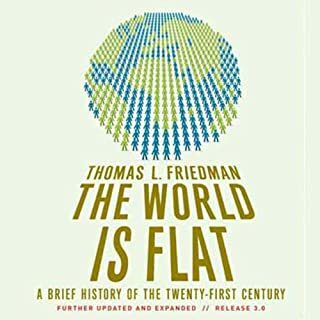 In his most ambitious work to date, Thomas L. Friedman shows that we have entered an age of dizzying acceleration - and explains how to live in it. Due to an exponential increase in computing power, climbers atop Mount Everest enjoy excellent cell phone service, and self-driving cars are taking to the roads. A parallel explosion of economic interdependency has created new riches as well as spiraling debt burdens. Meanwhile, Mother Nature is also seeing dramatic changes as carbon levels rise and species go extinct, with compounding results. How do these changes interact, and how can we cope with them? To get a better purchase on the present, Friedman returns to his Minnesota childhood and sketches a world where politics worked and joining the middle class was an achievable goal. Today, by contrast, it is easier than ever to be a maker (try 3-D printing) or a breaker (the Islamic State excels at using Twitter) but harder than ever to be a leader or merely average. Friedman concludes that nations and individuals must learn to be fast (innovative and quick to adapt), fair (prepared to help the casualties of change), and slow (adept at shutting out the noise and accessing their deepest values). With vision, authority, and wit, Thank You for Being Late establishes a blueprint for how to think about our times. Summary: Three increasingly fast movements are unsettling the world. Friedman, without minimizing the danger, gives an optimistic account of how we can survive and thrive. I am broadly a fan of Thomas Friedman's general worldview. He is a progressive (by the definition of Jonathan Haidt's The Righteous Mind's understanding). He is a globalist (in a non-pejorative sense.) He is fascinated with technology, and while not universally trusting in it, he thinks that technology is the way that many of the problems of our world have been and will be solved. He also thinks that government has a role is cushioning the problems of the global markets and regulating those markets for the benefit average person. He does not easily fit into a left/right dichotomy on issues of economics, social safety net, foreign policy or many other issues. But it has been a few years since I have read one of his books and I am not a regular reader of the New York Times or his columns. Friedman is a bit of an outsider at this point. He falls into the general charge of technocrat and the problems with that label. He is deeply knowledgeable about world politics and for more immigration and more international cooperation, which again, is unfashionable. And Friedman is generally writing as an optimist with wonder about the world in an age that is more cynical and pessimistic. 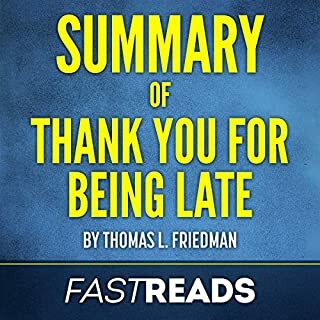 Thank You for Being Late is broadly about the increasing (and Friedman uses the term exponential often) growth of three area, computing (especially the movement toward big data), global market forces (and this is broad to include trade, immigration and migration and ideas) and climate change. Friedman is not shy about the fact that the world is scary. We know more about the world know than at any other time and we cannot and should not hide from that knowledge. But we also have limited capacity to absorb and process and change. "The ancients believed there is wisdom in patience, and that wisdom comes from patience. Patience wasn't just the absence of speed, it was the space for reflection and thought. We are generating more knowledge than ever before...but knowledge is only good if you can reflect on it." I like Friedman's writing style, but he can tend to overwhelm the reader with examples and stories to make his point. So there is far too many fascinating stories and examples that prove his point to really mention. But starting in about 2007, there has been an exponential growth in the ability of technology to collect and harness data. Part of this is felt in the always connected worker. But it is also felt in the slightly too targeted ads that feel like someone is always watching you, and they are. The use of big data, and the continued shrinking of tech so that iPhones and small sensors and drones can do things that were not really even imagined just a few years ago has cooperated with increasing global markets to make the world seem very, very fast and not particularly friendly to the average small business or worker. Jobs are being gained on the whole, but many of those that are being lost are being replaced by automation or lower wage replacement workers (either locally or somewhere else.) The markets have not been friendly to the working class and/or lower skilled worker, especially in some particular parts of the economy. So for the first 2/3 of the book I alternated between wonder and terror. Innovation and technology can be amazing. But the implications of innovation and technology can be terrifying. Globalization can and has driven many people from the lowest part of world poverty, but also is knocking many previously middle class people back into poverty. And climate change is almost solely terrifying. Friedman suggests that history is driven by contacts with those around them. The innovative adapt and incorporate, and the more brittle resistant cultures resist and reject the other. Part of the implication of this is that they learn less from others and lose the ability to contribute new ideas to the mix that come about because of adaptations and innovations. Friedman does not explicitly draw on Haidt's Moral Foundations Theory. But it is hard not to see the problem with inherently conservative values of loyalty (to the local group and culture) and purity (against innovative and outside views) being a weakness to globalization, technological change and climate change. Looking within the US, many rural, or to a lessor extent the White working class that is non-rural, are reacting against innovation, globalization and pluralism with both the election of Donald Trump and the rise of Bernie Sanders. Those conservative values are positive according to Haidt's theory (because that loyalty and purity and other conservative values have positive aspects as well as negative.) But according to Friedman's theory of globalization, there is an inherent negative aspect to it. With the exponential growth of computers (requiring continuous education and retraining) and the exponential growth of globalization (requiring cultural pluralism) these conservative principles have a real negative impact on job growth and wealth creation. And many in the US still deny that climate change even exists as a real problem. Approximately the last 1/3 of the book is Friedman's own reflections on his life, his community and how he has experienced change. Friedman is 63 years old. When he started as a journalist, he was typing with manual typewriters. He described how his job as a foreign journalist changed over the years, continually dealing with new technology and changing expectations for the job. And he has a long section about the suburban Minneapolis community of St Louis Park, where he grew up. That community was one of the few suburban areas open to Jewish residents and in a small period of time generated a remarkable number of world famous people. Friedman posits that it was the forced pluralism and integration of ideas that helped to generate people as widely known as the Coen Brothers, Senator Al Franken, Marc Trestman (NFL) and more. Friedman walks through that long autobiographical and community section to suggest that if we create good pluralistic environments (not just on acceptance of the other, but a pluralism based on trust and respect of the other), we value strong, continuous education, local innovation in government and industry, we do the hard things, just not the expedient or easy things, we work on including the whole population, not just those that want to be included, etc, then we can come out of this perfect storm as a storm of opportunity and not disaster. The weakness of the book is that it does not seriously address the problems of the parts of the world that are resistant to change or actually against increasing change. Friedman views resistance to change as not only a weakness, but a rejection of reality. He isn't dismissing the pain of change or the unequalness of who is forced to change. But this is already a long book and I do not think that Friedman has the psychological or sociological chops to really deal with that weakness. The positive of the book is that it really is an optimists guide to subjects that are actually pretty scary. Excellent but with some reservations. Likewise his assessment of Climate Change is, if anything, understated. Our collective unwillingness to address this issue is something future generations will hold their ancestors accountable for although one could doubt that there will be a rosy future if climate trends continue on their current slope. Parts of his third theme are harder for me to accept as presented. Driven by Technology and Climate aberrations an increasing number of societies and governments have either collapsed (Libya, Somalia) on the edge of collapse (Venezuela, Afghanistan) or increasingly repressive (Syria, Iran). Millions of people can not enjoy the benefits of modern civilization and some, aided by technology, have turned to violence and terrorism as seen in contemporary Europe. Population growth shows no indication of abating which further exacerbates the social, political and civil discourse problems. My issue with a relatively small part of the book is where he drifts back to his Norman Rockwell childhood in Minnesota and to me it seemed a non sequiter to the rest of the book. The book was completed before the U.S. elections but rather that be an objective observer of the domestic trends and anxieties Friedman allowed his antipathy towards our now president-elect spill into his book where he calls him out by name. That is fine for NY Times opinion page but I personally was offended that he took this otherwise outstanding book to criticize just one candidate without addressing some of the flaws of the other candidate or the underlying issues. On balance, despite my comments above, I recommend this book to anyone who is interested in the increasingly interconnected world of technology (for good or evil), Climate change and its implications and, finally, how all of this accelerating change is impacting everyone from localities to the greater global community. Time is not our friend as these issues manifest leaving entire swaths of different societies adrift. This book did little to assuage my concerns about the future that will be presented to my four year old grandson. I should have known that “Thank You for Being Late” is not for me, and not just because I’m not an optimist when it comes to our “Age of Accelerations”. The book has an interesting premise in that idea (the need for a “Guide to Thriving in the Age of Accelerations”), and borrows perhaps its strongest metaphor for it from a Brandi Carlile song, The Eye: “You can dance in a hurricane / But only if you’re standing in the eye.” However, the fundamental flaw in the book is not its sheer ambition (“A field guide to the twenty-first century, written by one of its most celebrated observers”, something that could be admired had it been successful) but the ego behind that ambition (apparent in that blurb) which eventually trips it, as is often the case. Friedman knows that his core values are not only deeply personal but contradictory, too. Hey, whose aren’t, right? The thing is, though, most of us that are aware of that (and have normal size egoes) don’t claim to have written a “field guide to the twenty-first century” nor bill ourselves as “its most celebrated observers”. (If you’re looking for something closer to that, check out instead “Homo Deus: A Brief History of Tomorrow” by Yuval Noah Harari.) And most who do, would not dismiss philosophers so blithely. However, Friedman is somehow not bothered by the inconsistencies in his thought brought about by the idiosyncrasies of biography. Instead of trying to address them, learn from them and transcend them (something that would have been laudable, perhaps even valuable), he instead tries to force them together into an grotesquely incoherent mishmash of platitudes held together only by that formidable ego. He obtusely tries to throw these incoherencies upon humanity, not caring much how well they may fit, let alone stick. Not only does he borrow metaphors left and right (from folk rock song lyrics and systolic and diastolic blood pressure, to Hollywood movies and studies on NPR about dance coordination), but he then squeezes them beyond their endurance, resulting in a text that would be funny had it not been so pretentious. And then he has the temerity to wax poetic about transforming the “other” to a more inclusive “all”. We — the other chaotic Arabs that do not adhere to American-Israeli dictum — have a saying for that: “He killed him and walked in his funeral procession” and “If you have no shame then do whatever you want.” They’re meant as warnings, not challenges. But we live in a shameless world. Being so demoralized, disheartened, and dismayed at the results of our recent election, I needed something to lift me out of the metaphorical mud pit in which I find myself. I was inspired by Charlie Rose's recent interview with Thom. Freidman. Here comes a voice of reason from among the morass of ignorance that so pervades our country and politics today. Freidman' clarity of vision helps explain the inexplicable. He goes a little overboard about the Minnesota Way that cemented the early development of his value structure, but points out that there is cause for hope if only our leaders (and followers) take some of those values to heart. 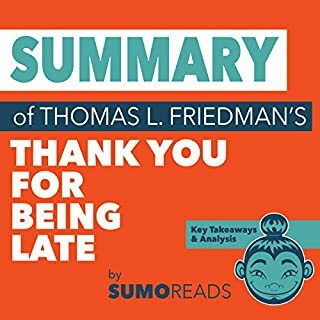 "Thank You For Being Late" should be required reading for our entire population. Proof of such should be mandated of all in leadership position. It's a new era. The cheese has indeed been moved. Get on board or you'll never again clear the dust from your nostrils! An excellent book, full of ideas that might help our society move in a better direction and an interesting way to try to understand the times we live in. I leaned so much I didn't know about modern technology -- fascinating and hopeful. I also gained an understanding of how countries can't really not participate in our global society at this point, because climate change, over population, unstable governments, and lack of opportunity are causing people to migrate because there is no hope where they live and this is and will effect all parts of the world. If you could sum up Thank You for Being Late in three words, what would they be? What was one of the most memorable moments of Thank You for Being Late? The novel is full of examples and stories that bring the point home. Some of the more memorable have to do with the technological advances we are dealing with, how chickens can change lives in a big way, and how a political party would behave if it was like mother nature. 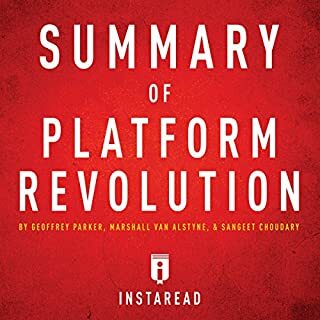 I am new to audio books so this was my first time listening to Oliver Wyman. He did a fine job with a very fact heavy book. It was not an earth shattering performance but it was solid and kept me engaged. There are several moments that made me chuckle due to the ironic humor the author has. At other times you can't help but wonder "why is this not happening?". If you follow current events this book goes in depth into many of them facing society today. This is a superbly written book. I enjoyed listening to it but I feel like this one would be better read in hard copy. I plan on purchasing it so that I can make notes and highlights. There is so much information to digest that being able to annotate would enhance the experience. Relevant and appropriate today - a guide to impactful forces. Liked his breadth and depth of analysis of key impactful forces- Friedman develops some themes he's written about before. His worldview has been modified since 2007 - the year iPhones were invented. His premise - so much has changed since 2007 - a 'new' book is warranted. Should be of interest to Friedman fans and those who read about large changes impacting society. Friedman remains hopeful/optimistic - well written. He shows a great snapshot of the world today. Uses great examples to show his readers where the world is heading. Great book! A little fluff. I really loved reading this book and have thought about sending it to friends with small children so that they can at least read the first two sections. I know I would have raised my kids a little differently if I'd had it back then. The section on Moore's law was exceptional and only omitted the mention of quantum computing taking us on a joyride that Moore never anticipated. The climate change section was heartbreaking, and my great fear is that that cow has already gotten out of the barn. Time will tell. My only minor complaint is that the last three chapters essentially amount to an autobiographical rendering of the author's childhood in Minneapolis and, while I understand his point, I think it could've been shrunk to one third the size he gave it and still made the point adequately. I also very much like the reader. Readers have funny affectations in their voice that show up even more dramatically when you are at 1.25 or 1.5 speed. This one had great diction and clarity at all speeds.